Analysis of 9 basic methods of modification is given and ways of increasing of their effectiveness are shown. It is shown that the method of casting by mixing of single and two-phase melts, method of quenching solidification casting and casting into crystallizer with jet cooling system are best and universal ways of modification and means of activation of the process of modification of metals and alloys. Manufacture of low-sulfur steel remains the real problem for casting. Desulphurisation during refining for melting in open hears and arc furnaces is limited, and it seldom exceeds 0,010%. For deeper desulphuration it is rationall to carry out ladle treatment of steel during alloying composition with alkaline-earth and rear-earth metals. It is experimentally established, that the consumption of alloying composition should not exceed 3,5%, and the additive of fluor spar in a mix should be no more than 50% from weight of a mix. Such processing leads to decreasing of the sulfur content in metal, to reduction of nonmetallic inclusions in steel and increasing of properties of metal. At the Alma-Ata Heavy Engineering Works they have mastered a new technology of making grinding balls to be used for grinding minerals. The results of using it indicate the high efficiency of using new compositions of wear- and impact-resistant alloyed irons, the melting and casting technology for making grinding balls. Design versions and processes of manufacturing cast bimetallic friction bearings allowing to considerably reduce the cost of manufacturing them as compared to nonferrous single-layer bearings are discussed. The main factors influencing the sand mold filling quality have been examined. Mechanism of their complex action on the melt castability has been established. For the first time, the role of the mold erosion products in the "shut" defect formation processes has been determined. Necessity of foundry re-equipment for achieving the required mold parameters has been shown. Possibility of using a self-curing mold wash with an aqueous solvent has been investigated. Water glass diluted with water was treated with oxalic acid. The upper and lower limits of water glass density have been determined, at which curing is either impossible or instantaneous. The found dependence of pH of water glass treated with the acid allows regulating the bench life of the self-curing wash in the range of 0.33 to 160 min. The aqueous coating developed on the basis of the investigation results has successfully passed the production tests as a substitute for quick-drying washes with organic solvents. Advantages of cold-hardening sands are discussed, choice of mixer type has been substantiated, particular features of calculating sand amount are considered. Formulas for calculating the minimal required mixer capacity are given. Applications of continuous and batch-type mixers have been delimited. Numerical new sand/reclaimed sand ratios for mold and core making are given. Process and non-standard equipment for mold-and-core making shops made by FGUP NIITuglemash's designs is reported about. Smirnov A.S. et al. What a Quality System at a Foundry Is Needed for? 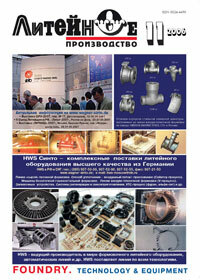 The article advances arguments in favor of introducing the ISO 9000 quality system at foundries. The conventional approach based on the quality control of finished products fails to provide a high product quality level for the international market, which is especially important in view of Russia's joining the WTO. A foreign enterprise will not consider a supplier that has no ISO 9000 quality system. Abramov A. A. et al. Use of Computer Simulation in the Development of Aluminum Alloy Casting Production Processes A system for computer simulation of casting processes called "Poligon" was used in the development of aluminum alloy casting production processes. With the aid of the system a variant of improving the low-pressure die casting process for making car wheel disks from A356 alloy was found, the process of making cast cylinder blocks for ship engines from AK9ch Al alloy in a sodium silicate bonded sand mold with iron chills was corrected, the problem of improving the monoblock casting quality was solved. The examples given demonstrate wide capabilities of computer simulation, in particular, those of the "Poligon" system, in searching for nontrivial technical solutions in adjusting the process of making defectless castings and conditions of making castings with a predetermined level of quality.